We expect this update to take about an hour. Access to this website will be unavailable during this time. Imagine going to a worksite only to find that your hard hat is so large that it slips off your head, or that the fall arrest harness doesn’t fit your body correctly. As more women are entering construction, they are discovering that the personal protective equipment (PPE) available doesn’t always fit them. PPE is the last line of defense for a worker when it’s not possible to eliminate the workplace hazard, but if the personal protective equipment doesn’t fit properly it can’t do its job. Numbers from the Canadian Construction Association reveal that the construction industry is one of Canada’s largest employers, employing 1 in 13 working-age individuals and over 1.4 million Canadians. Despite employing such a large percentage of Canada’s overall workforce, women remain dramatically under-represented in the industry, accounting for only 12 percent of the total workforce. Nearly 75 percent of the women tend to work in off-site occupations such as business administration, management, and sales. Still, that is almost 170,000 working at construction sites. Construction has been an industry traditionally dominated by male workers and as a result much of the PPE developed and manufactured for this industry has been designed for men. This means that it often doesn’t fit women properly. PPE is worn by a worker to minimize exposure to specific occupational hazards. Some examples of PPE include respirators, gloves, aprons, fall protection, and overalls, as well as head, eye and foot protection. Using PPE is one element in a health and safety program that should use a variety of strategies to maintain a safe and healthy work environment. PPE does not reduce the hazard itself nor does it guarantee permanent or total protection. PPE is the last step in the hierarchy of controls, making it the last level of protection between the worker and the hazards. Therefore, it is especially important that the correct PPE is selected, worn, and maintained. Studies in the United Kingdom show that women working in hazardous industries such as construction often don’t have access to correctly fitting PPE and in some cases the PPE can be a nuisance and create a hazard rather than protect the worker. Construction workers rely on PPE to protect against hazards at work. This includes equipment such as hard hats, reinforced boots and protective gloves to protect against physical injury. Not only do these items need to meet quality and safety standards in terms of material and design, proper fit is crucial to ensure that they are effective. Because the construction workforce has traditionally been made up of mostly men, the production and procurement of PPE has been based on the needs of this group. This is reflected in the vast amount of PPE designed and standardized based on the male body. Equipment designed for men will often not fit women properly due to differences in body size, height and composition, and PPE cannot protect a worker from hazards if it does not fit. In a 2014 study of female construction workers in the American Journal of Industrial Medicine, the majority of participants reported fit problems with many types of PPE, including gloves, harnesses, safety vests, work boots, and outerwear. The common observation was that the equipment provided was too large and required adjustments and modifications by the worker. Not only is improperly fitting PPE detrimental to safety and productivity, it can also have a harmful affect the employer-employee relationship if the worker feels that aren’t being treated fairly or that their safety is being compromised. All workers have a right to a safe workplace. PPE designed for the dimensions of an average male worker means that female workers may be forced to rely on gear that is too large or disproportioned. From headwear to footwear, ill-fitting PPE can cause safety hazards, reduced dexterity from oversized gloves, hard hats that fall off, baggy coveralls catching on equipment, and trips and falls because footwear or shoe covers are too large. Employers need to consider female workers when purchasing PPE. Some manufacturers produce unisex PPE but even they may not fit a woman properly. Employers should look for distributors and suppliers that offer a full range of for both men and women. Providing PPE in this way can also accommodate the wide variety of different body types that exist in both male and female workers. By recognizing the physical differences between genders, employers can show support for female workers in construction by treating them fairly. This can also support the changing construction workplace culture as more women enter the industry. Availability of PPE is improving as manufacturers are making PPE specifically for women. Also, safety and industry standards are being revised to reflect the needs of smaller-sized people by making standards less design-restrictive. A commonly mentioned reason for the failure of a PPE program is the inability to overcome worker objections to wearing the equipment. When women don’t have properly fitting protective equipment they may be tempted to alter it, which should never be done, or may not be able to wear it at all. Finding the right sizes and getting the right fit of PPE for all workers is an important basic step to protecting them from harm, as well as a key component of any safety program. If you've ever slipped on an oily patch of floor or tripped over a loose piece of carpeting you know how easy it can be to take a fall. And if you did fall, you would join the more than 42,000 people who get injured each year in work-related falls. That's about seventeen percent of the "time-loss injuries" across Canada as well as a lot of economic loss, pain and suffering, and sometimes even death. You may be surprised to learn that most falls don't happen from roofs, ladders, or any other heights. In fact, around sixty-six percent of falls happen on the same level, caused by slips and trips. Here are some things you should know to prevent "falls on the same level". Slips and trips happen when there is some unexpected change in the contact between the feet and the ground or floor. Keeping that in mind, there are four factors that should be addressed in preventing fall accidents: 1) good housekeeping; 2) quality of walking surfaces (flooring); 3) proper footwear; and 4) pace of walking. Clean all spills immediately and mark spills and wet areas. Mop or sweep debris from floors. Remove obstacles from walkways and always keep them free of clutter. Secure mats, rugs and carpets that do not lay flat with tape, tacks, etc. Close file cabinet or storage drawers. Cover cables that cross walkways. Keep working areas and walkways well lit; replace used light bulbs and faulty switches. Changing or modifying walking surfaces to provide "sure footing" is an important step in preventing slips and trips. Recoating or replacing floors, installing mats, pressure-sensitive abrasive strips or abrasive-filled paint-on coating and metal or synthetic decking can further improve safety and reduce the risk of falling. Also, resilient, non-slippery flooring prevents or reduces foot fatigue and can help prevent slips. In workplaces where floors may be oily or wet or where workers spend a lot of time outdoors, selecting proper footwear is essential to preventing fall accidents. Since there is no anti-slip footwear ideal for every condition, it is recommended that you consult with manufacturers for the available options best suited to your needs. Wearing footwear that fits properly increases your comfort and prevents fatigue which, in turn, improves your safety. Safety is everybody's business; however, it is employers' responsibility to provide a safe work environment for all employees. As an employee there are steps you can take to avoid falling at work. Taking your time and paying attention to where you are going. Walking at a pace that is suitable for the walking surface and the tasks you are doing. Walking with your feet pointed slightly outward. Making wide turns at corners. Keeping walking areas clear from clutter or obstructions. Keeping flooring in good condition. Using installed light sources that provide sufficient light for your tasks. Using a flashlight if you enter a dark room where there is no light. Ensuring that things you are carrying or pushing do not prevent you from seeing any obstructions, spills, etc. This month’s featured podcasts include an interview with Charmaine Salter who shares her family’s personal experience with the loss of a family member due to a workplace tragedy and an encore presentation of Understanding Workplace Concussions. Threads of Life speaker Charmaine Salter talks one-on-one with the Canadian Centre of Occupational Health and Safety (CCOHS) to share her family’s personal story of how their lives were forever changed by a workplace tragedy. The podcast runs 8:26 minutes. Listen to the podcast now. Concussions can occur anywhere, including in the workplace. Statistics reveal that there has been an increase in the number of time loss claims for work-related concussions. This podcast provides tips and information to help understand concussions and how to manage them in the workplace. The podcast runs for 6:00 minutes. Listen to the podcast now. In conversation with the Canadian Centre for Occupational Health and Safety (CCOHS), Elaine shares her own experience regarding the importance of supporting affected families and making sure that young workers are safe on the job. The podcast runs 4:23 minutes. Listen to the podcast now. CCOHS produces free monthly podcasts on a wide variety of topics designed to keep you current with information, tips, and insights into the health, safety, and well-being of working Canadians. You can download the audio segment to your computer or MP3 player and listen to it at your own convenience... or on the go! 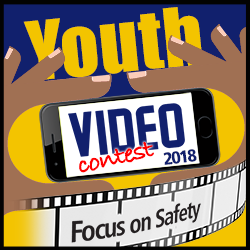 Every year, as part of North American Occupational Safety and Health (NAOSH) Week, CCOHS sponsors the Youth Video Contest to encourage students from across Canada to create videos illustrating the importance of workplace health and safety. The top video from each participating province and territory moves onto the national stage, where a judging panel selects the first, second and third place winners. Everyone else can have their say by voting online for their Fan Favourite from April 26 – May 3, 2018. 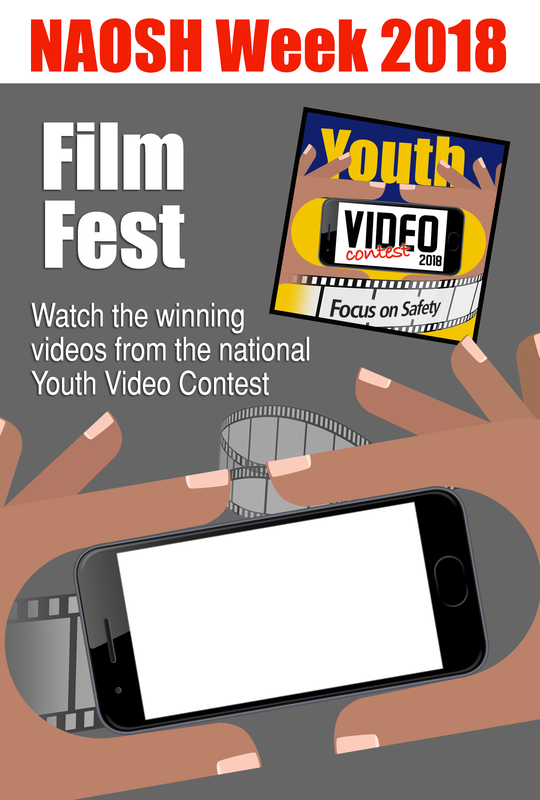 As part of your NAOSH week celebrations why not hold your own Film Fest featuring the winning entries from the contest? Turn a meeting room into a theatre by setting up a projector and screen. Connect a laptop with speakers, and run the YouTube playlist of all the top videos. For more ideas and information about NAOSH Week, visit the website. We welcome your feedback and story ideas. The Health and Safety Report, a free monthly newsletter produced by the Canadian Centre for Occupational Health and Safety (CCOHS), provides information, advice, and resources that help support a safe and healthy work environment and the total well being of workers. You can unsubscribe at any time. If you have been sent this newsletter by a friend, why not subscribe yourself?